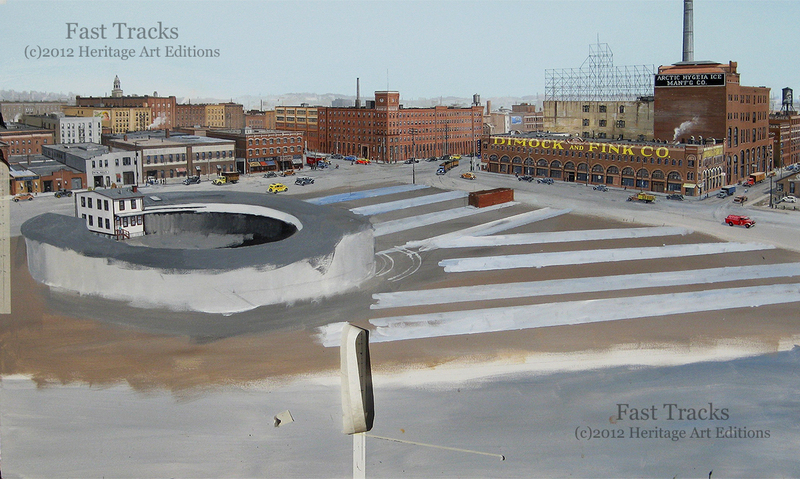 Earlier this week we received a progress shot of our CNJ Bronx Terminal painting by Larry Fisher. Needless to say we were astonished at how well it is turning out! Even better than we had anticipated…. It was decided to go with the waterfront perspective as opposed to the view from the road. The view from the road was interesting as it provided a nice perspective of the complex trackwork of the terminal. 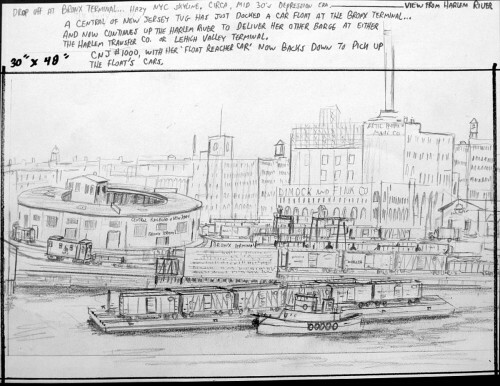 However I was partial to the waterfront view as it will allow for a period tug boat and carfloat loaded with vintage equipment to be included in the painting. 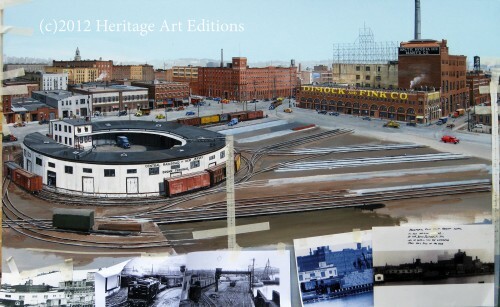 I had Larry raise up the viewpoint to allow for more trackwork detail to be included in the painting, which he has done wonderfully. In this view, when completed, we will be able to see the most complex of the trackwork, the quad diamond and some of the curved three way turnouts. Still to be added will be engine CNJ 1000 lugging a cut of cars from a carfloat up the floatbridge, as well as the tug and carfloat. The yard will also be populated with equipment and details. All in all it is shaping up to be one of Larry’s finest works and we can’t wait to see the next update! Larry has done a great job on the background buildings. The detail and accuracy are superb! Having spent a lot of time researching this area I can say with confidence that Larry got it all correct. Its great to see it come to life in colour. If you click on the image for a larger view, you can see some of this detail. There is a lot of action going on in the shadows and still more to come as he refines and adds more to the image. The freight house is just beginning to get added, and Larry has promised another update when there is more detail there to see. Wouldn’t you just love to have Larry paint your backdrops? A close in detail shot of the buildings in the background. 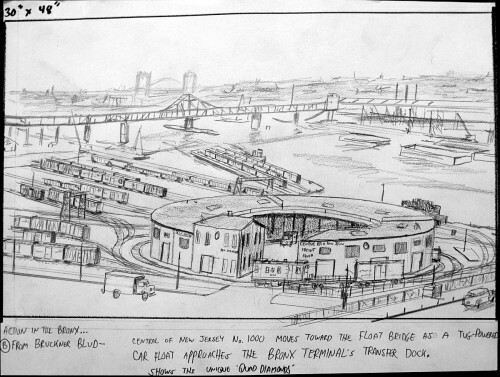 Its interesting to see how it compares with the initial conceptual sketch that Larry provided. Raising the viewpoint up so more detail of the yard can be seen was well worth it. 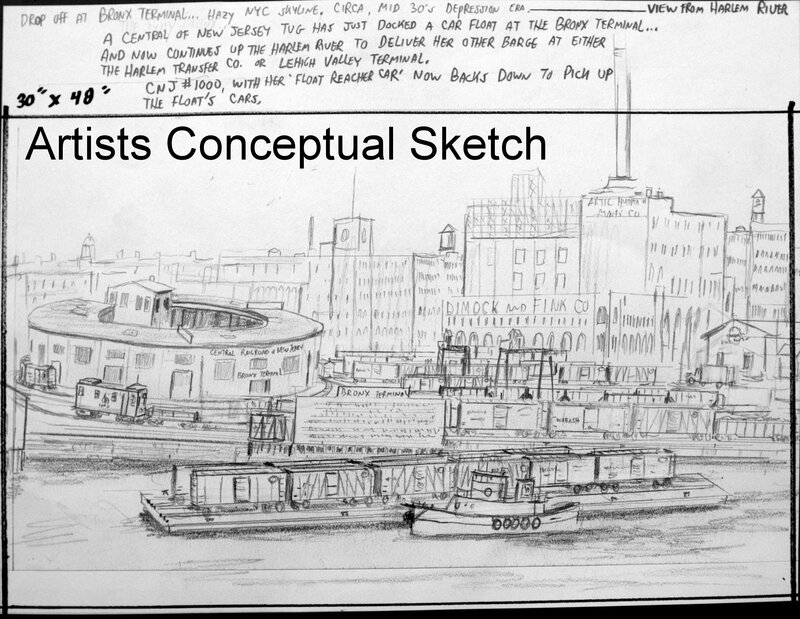 The tug and carfloat in the front of the image is going to be stunning! We expect the painting to be completed and prints to be available early in the new yearl. Until then, an introductory offer for prints, artist proofs and publishers proofs will be available to Fast Tracks customers. 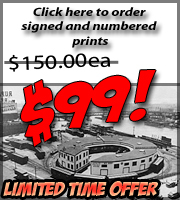 Order now to ensure you receive the print number of your desire. As work progresses, pictures will be posted on the CNJ Bronx Terminal blog. We will also send out email updates with details of the project as it moves along. 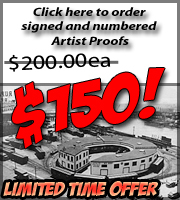 Pre-order your signed and numbered print now! Click on image above. CNJ Bronx Terminal painting project! 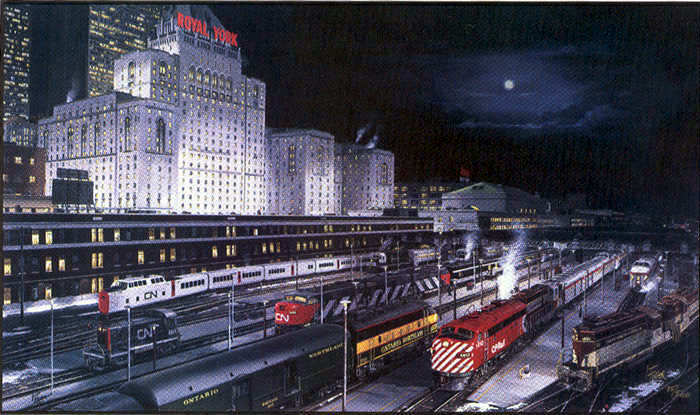 For the last few years Don Davies of Heritage Art Editions and I have been batting around the idea of having Larry Fisher do a painting of the CNJ Bronx Terminal as it once stood in New York City. We both agreed it would be a great subject, merging both rail and marine operations under the backdrop of the New York City skyline. 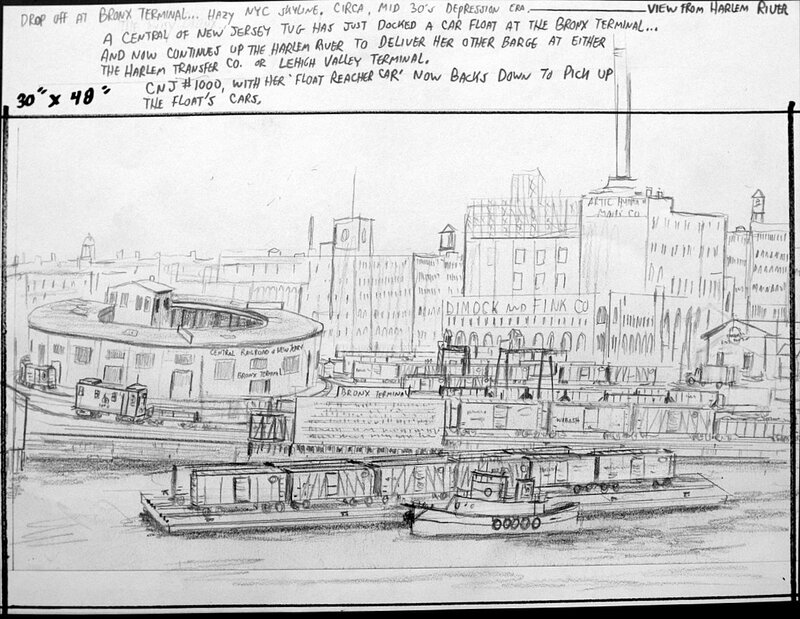 Typical of Larry Fishers work are images with great detail, accuracy and precision and having a painting of the terminal done by Larry would surely be a spectacular piece! Over the last few weeks Don and I have worked out the details of such a project and I have gave him the go ahead to have Larry start the work! Chances are you have seen some of Larry’s work. 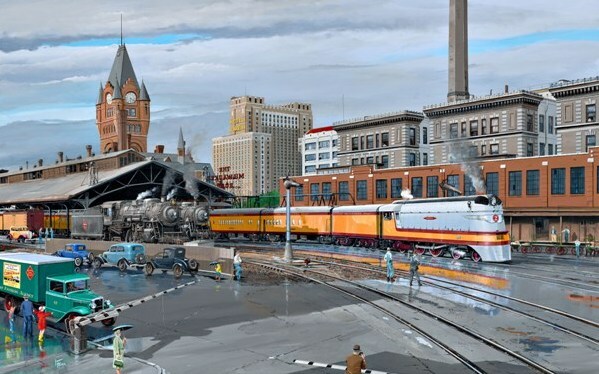 For the last decade or so Larry has been producing spectacular works of railroad art in acrylic for Heritage Art Editions which are typically sold at most major train shows in North America. 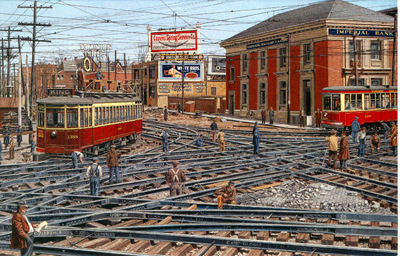 My favorite Larry Fisher print (I have several) hangs in my office and it depicts, of course, a mass of very complex trackwork at the intersection of King and Queen Street in Toronto in the mid 1920’s. 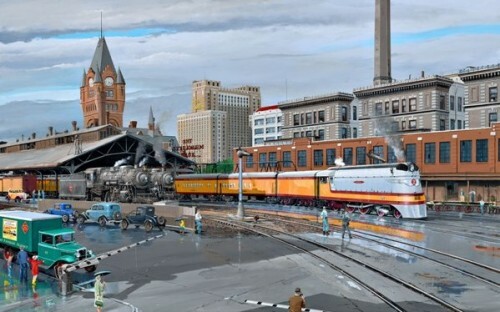 The scene is a reproduction of a photo taken when the Grand Union (the intersection of four double track streetcar lines) was replaced over a 24 hour period. The precision of Larry’s work in this image is stunning. I have spent a great deal of time studying this painting and the work is flawless. Considering the complexity of the subject matter, that is quite an achievement! A complete bio of Larry Fisher can be found at the bottom of this post. Once I decided to go ahead with the painting, Don and I met to discuss the details of the project. We settled on a “large format” painting, which means the original work will be 30″x48″. This size will allow Larry to add a lot of detail into the image, and considering the subject matter, this will be necessary! We also decided on doing a run of lithograph prints of the completed work. 500 signed and numbered prints will be produced, with the first 250 being available for sale through the Fast Tracks website (more detail on that later). A limited number Artist Proofs and Publishers Proofs will also be available. I supplied Don and Larry with my entire collection of CNJ Bronx Terminal reference material. From that information Don and Larry spent a couple of days at Larry’s Las Vegas home going over what was available and Larry worked up a couple of concept sketches for what he thought would make an interesting view. 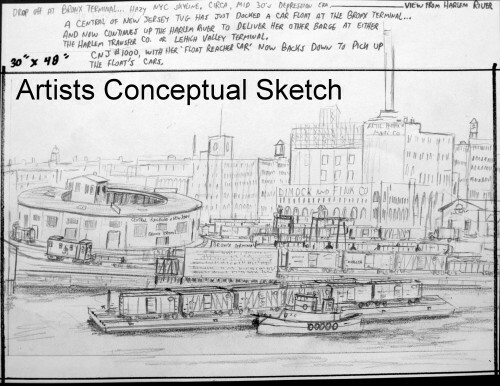 The sketches above are simple concepts provided by Larry and don’t represent precisely how the finished work will look. Like all of Larry’s work, the finished painting will have almost perfect perspective and proportions, these were just quickly done to present a couple views that Larry and Don think will make an interesting perspective. I am leaning heavily toward the first image, with a view of the river with the terminal in the background. This will allow a good view of the tug (likely The Branchton) moving a loaded carfloat up the Harlem. A lot of great detail can be added to this view and I am pretty happy with the concept. 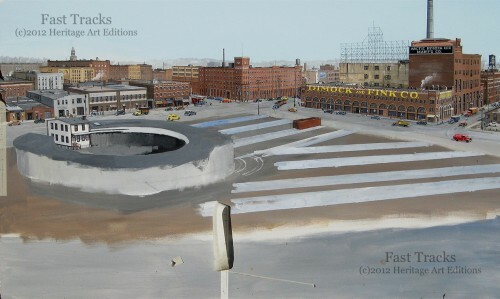 As mentioned earlier, I am having a run of lithograph prints produced from this work. When available we will offer them for sale on the Fast Tracks website. They will retail for $150 each. All will be signed and numbered by Larry Fisher personally. An introductory offer of $99.00 per print will be available for those that wish to pre-order a print. We will also be offering Artist Proofs and Production Proofs for a regular price of $200 each, with an introductory offer of $150 each. We are in the process of setting up individual pages on the Fast Tracks website for each print number. This way you can select a specific numbered print if you wish. If that print is not available it will simply show as out of stock. If you are interested in a print number above 250 or a Artists or Publishers proof above number 6 let us know and we will do our best to get it for you. Once all the necessary pages have been added to the site I will add the links here. I am expecting to have the completed painting later this fall, and the prints available shortly after that. As we receive in progress shots from Larry I will be posting them here so you can watch at the painting progresses. Should be exciting to watch it all come together! Feel free to give us some feedback on what you see…. This week we received an update shot from Larry of the work in progress. Needless to say, its coming along great! Larry Fisher’s interest in the railroad dates back as far as he can remember. He was born into a railroad family, May 9th, 1939. Larry’s father, Donald, a Soo line retiree after more than 35 years as a brakeman and conductor was a great influence both as an artist and as an avid fan of the railroad. During his father’s early years on the Soo Line Railroad, his job took him away from the family for long periods of time. Larry’s dad would always send letters back home and would include a pencil drawing of a train scene for Larry and his brother Darrell. 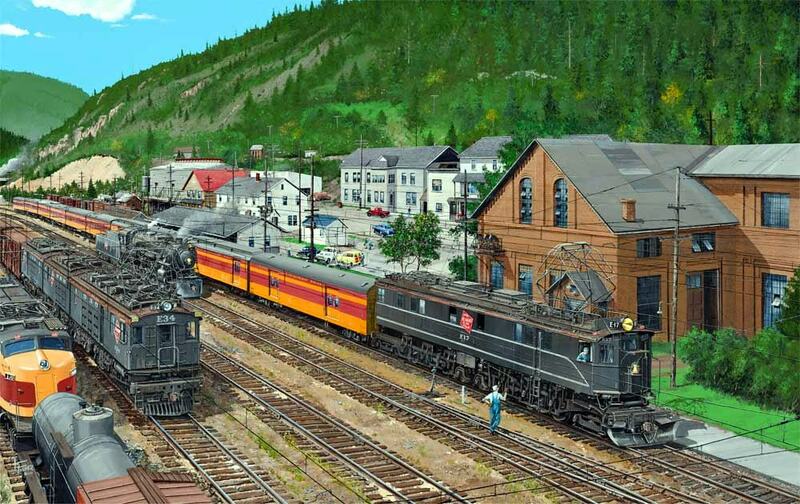 Darrell would later go on to work for the Milwaukee Road out of Harlowton, Montana. In the return letter that Larry’s Mom would write to her husband, Larry would include a crude drawing of his own. Actually, Larry’s interest in trains took root much earlier. 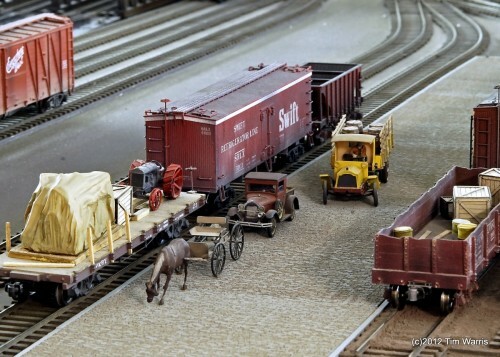 At about the age of three, his dad worked for about a year in Sparks, Nevada on the Southern Pacific Railroad. Larry’s only memory of that period of time was Southern Pacific’s cab-forwards and long lines of yellow reefer cars. 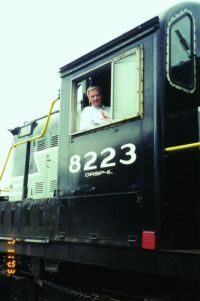 The reason he knows this is when they returned to North Dakota, his Soo Line drawings would sometimes include a cab-forward with the Soo Line logo on the train’s tender. Following graduation from Harvey, North Dakota High School in 1957, Larry joined the Air Force. He continued his drawings but just in cartoon form for his buddies in the barracks. In 1964, following a stint in the Air Force and a year of driving a taxi, he went to work for KTHI-TV in Fargo, North Dakota as a cameraman and set designer. In 1969, he moved to Las Vegas, Nevada where he still resides with his wife Carol. They have two children, Sheryl and Jon and now have one grandchild, Preston. 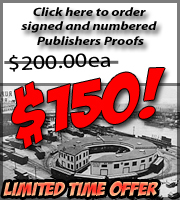 Larry’s big break came when he was asked to do a cover for a national magazine….RAILFAN & RAILROAD. This March 1981 cover led to other magazine and book covers and eventually Limited Edition Art Prints. 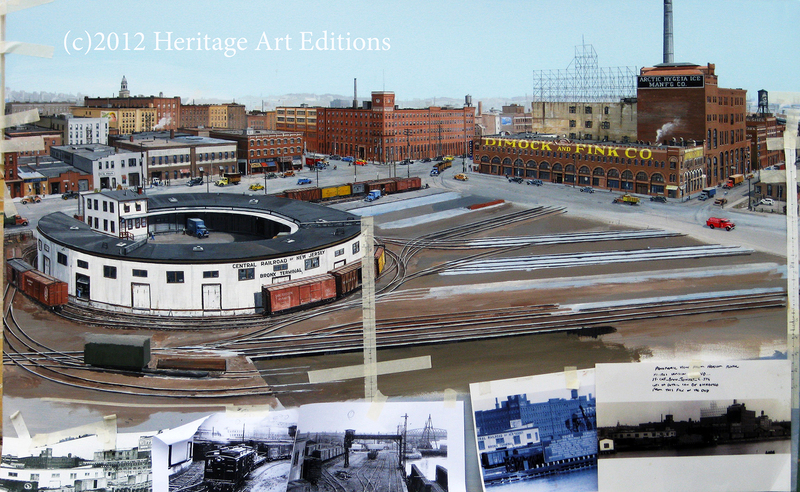 As Larry Fisher’s Art Publisher for many years, Heritage Art Editions is dedicated in preserving the memories of our heritage and the history of days gone by. We have sold and distributed his original paintings, Giclee and Lithograph limited edition prints, greetings cards and calendars around the world to corporate customers, private collectors and our art dealers. Larry primarily works in three mediums…oil, pen and ink and acrylics. Acrylics are his favorite. His talents are self-taught or as he puts it “trial by error” as he works on each painting. A stickler for detail, a magnifying glass and #1 brush are the most important tools of his trade. In 1998, after 30 years at Channel 13 Television in Las Vegas, Nevada Larry retired to devote all his time to his paintings. This now includes different means of transportation such as automobile scenes, streetcars, motorcycle, aircraft, tractors, vessels and others from the past as well as his favorite, railroad settings. His basic philosophy in each painting he starts is to try and recreate on canvas, an actual scene from a bygone era. A setting that will never be captured on film again…such as Union Pacific Railroad’s Big Boys storming over Sherman Hill, Southern Pacific’s cab-forwards battling Donner Pass or Canadian Pacific’s Selkirk’s winding over and through the rugged Canadian Rockies and many more scenes that are now only memories. The paving project will have to wait for a while as tomorrow I am taking the layout up to the Credit Valley Model Railway train shop in Toronto for their local layout tour this coming Saturday April 14th. It will remain there until the end of the month when I will pick it up on the way to Ottawa for the inaugural Ottawa Train Expo, being held on May 5 and 6th. The layout will be set up and operating in the Fast Tracks booth for the duration of the show. If you are in the area, be sure to check out this show!